“The scream tore the night apart. Ta-Thea sat upright, the sweat cold on her skin. Moonlight poured through the long windows onto the marble floor. The screaming came again, then a man shouting and a clash of metal. But it was impossible, here in the palace!,” excerpted from page one, Chapter One, of Tathea, by Anne Perry. Wow!, is all I can say about this work, and this author, Anne Perry. On another one of my weekly sojourns to my local library, to see what fallen apples may be gleaned from the ground for the mere cents in my pocket, I found this book, “Tathea.” It was the first delving into the world of the fantastical, by this New York times bestselling author that had already become well read and revered, Anne Perry. She has written many other works, but this one, she herself, believes is her crowning achievement. I really enjoyed this book. I decided to not pursue everything I could learn about the author prior to reading it, as I often have done in the past, but this time, I wanted to see what I could learn from the work itself. It was a wonderful book, and extremely educational on several fronts. Tathea, copyright 1999, was published by Ace Books in New York, who are owned by The Berkley Publishing Group, which is a division of Penguin Putnam Inc. It is 522 pages. One thing in the acknowledgements is that it was printed by Shadow Mountain Publishing, and this is a general-trade imprint of Deseret Book, which is owned by the Mormon Church. Many of the Shadow Mountain authors are Mormons too…. …as is Anne Perry, but the book does not indicate this in any way. I am not a Mormon, so at first, I felt a little tricked. I just read this wonderfully written book, and then found out it may have been used as a stealth device to lead me into a world that I may not have explored on my own, and this gave me pause. Really! Then I thought, “Nah, I should have done my homework, and studied the author before I got so involved in this novel.” If I had, then I probably would not have read it. Anne Perry moved me. I enjoyed “Tathea” and am better for it. It would definitely fall in the category of fantasy, spiritual quest, and it is a book of the search and discovery for one’s purpose in life. Tathea, the main character will easily win your heart, and as she moves through the stages of her development, you will find yourself moved as well. As she seeks to embrace truth, and faces all those worldly temptations, you will find yourself nodding your head in agreement, and amazed at how simply grasped the truths she learns are. You will meet her Tathea’s guide, Ishrafeli, a Christ like figure, who leads and aids her in her quests. Here’s where you must now make a decision. Tathea’s journey is, I believe, an allegory for Joseph Smith, the LDS pioneer who discovered the original plates which became, “The Book of Mormon.” His guide was the angel Moroni. Again, I must be honest that I really did enjoy the book, but cannot recommend it to those friends whom I share my reading exploits with. The main reason, is that I do not always know how a book, a movie, etc, will be perceived by someone else. I would not want someone to be influenced by a work that I recommended, and cause them to stumble. 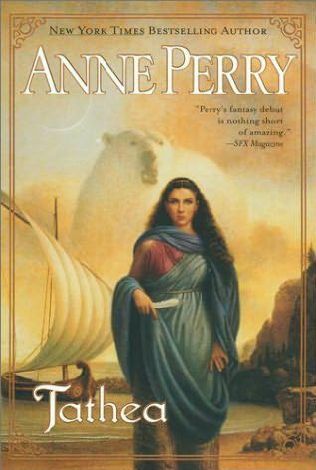 Had I know that “Tathea” was an allegory of the Mormon faith, I would not have read it, but having read it, I did enjoy the gift for writing that Anne Perry has cultivated. I don’t agree with the Mormon belief’s, and although the folks that I know that are Mormon, are for the most part genuinely pleasant people, (which I admire,) I can’t wrap my brain around many of their articles of faith. That being said, I appreciate the work that went into “Tathea,” and what I learned from it. I was genuinely moved by this story, and will never forget what Anne Perry said, “You can move people by stories, whether they wish to be moved or not.” What a responsibility on our authors. We must remember that when we move people against their wishes, we must also realize that we become responsible for the consequences that befall them…both good and bad. I am glad that God does not trick people into moving against their wishes. Oh, He surely is a God that moves people, but He is and always will allow people to choose if they want to go or not. Me? I want to go!